Mormon Wookiee: #116: The Homeless Reverend--Willie Lyle. #116: The Homeless Reverend--Willie Lyle. Working with the deacons (12 and 13 year-old young men) allows me to be a part of some fun and unique experiences. For example, this morning I got the opportunity to go to the local retirement home to pass the sacrament to the elderly branch there. It was a humbling experience. Despite poor health, many of the branch members still come to church each week with cheerful hearts and a desire to be among their fellow believers. Their ability to endure to the end is a great reminder for me to do likewise. One of the speakers this morning shared the inspiring story of a pastor who disguised himself as a homeless man before being introduced at his new church, in order to remind his congregation that being a true Christian means serving and loving others, especially those who are less fortunate than ourselves. Although the story did not actually happen, it had a powerful message. After coming home from the meeting, I researched the story and found that it is based on the true story of Reverend Willie Lyle, newly-appointed pastor of Sango United Methodist Church, in Clarksville, Tennesse. A couple of months ago, on his first day as Sango's new pastor (Sunday, 6/23/2013), Reverend Lyle shared the following powerful experience. 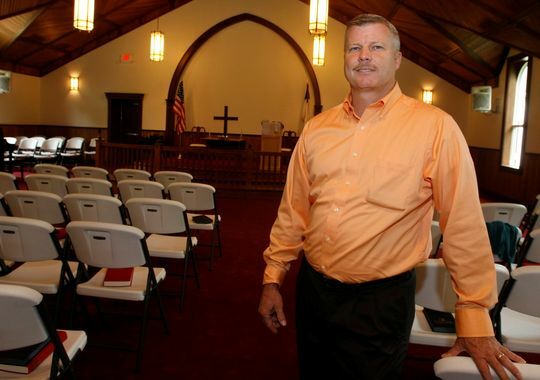 Reverend Lyle's story touched me deeply and reminded me of the Savior's words, "Inasmuch as ye have done it unto the least of these my brethren, ye have done it unto me" (Matthew 25:40).I have reposted his story below (as originally written here by Tim Parrish). Three days after receiving the news of his appointment as Sango's pastor, he (Reverend Lyle) was awakened by a dream at 2 a.m. This dream was different from any in the past. In this dream, God told Willie to do something very specific, and God promised Willie if he would do this, then He would provide for Willie and protect him. There was a problem. What God asked Willie to do was not something Willie wanted to do, and he had no interest in doing it. It was clearly out of his comfort zone. 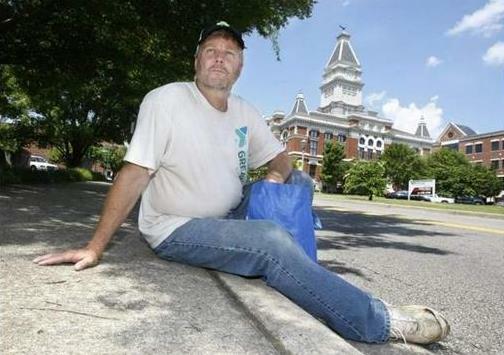 In that dream, God told Willie that he needed to live on the streets of Clarksville as a homeless and hungry person. He challenged Willie to experience firsthand just what it was like to have nothing - no home, no money, no friends, no food on even a semi-regular basis, no nothing. Essentially, what God was saying to Willie was, "I hear you preach the word of God and share the message of Christ. Now, I want you to actually live it. And I want to hear how you liked having nothing and being treated with disrespect and disdain by almost everybody. I'm not finished. I want you to tell your new congregation about your experience and challenge them to make a difference in the world, beginning right here in Clarksville." According to Willie Lyle, his conversation with God was pretty much a one-way conversation. God talked...Willie listened. "I didn't find any comfort in what I was hearing. I definitely wasn't comfortable with the idea of living on the streets, even if for only five days." Lyle continued and said, "My faith is incredibly strong. My relationship with God is the most important thing in my life. Without my faith, I am nothing and I am of no use to my family and others. But I was willing to do what God wanted me do." He also commented, "You know, life isn't always comfortable. Jesus wasn't comfortable on the cross." Pastor Willie's wife, Suzette, dropped him off in downtown Clarksville early Monday morning, June 17, and he lived on the street through the morning of Friday, June 21. In those four and a half days, he learned a great deal about the homeless, the working poor who face hunger daily and those in need of spiritual and emotional help. It was not comfortable. There was something else Willie learned, and it was not comfortable at all. He learned from firsthand experience just how many people who are fortunate in life look down upon and ignore the homeless, the hungry and the poor without ever taking the time to learn their story. "Generally speaking, people are not kind to the homeless," he observed. "I know there are people who live on the street and choose to do so. I am talking about the homeless and poor who find themselves in circumstances beyond their control and they have nothing," he explained. "Sadly, sometimes they don't even have hope. "They most definitely want food and shelter, but they also seek the food and shelter found in the message of Christ. I'm not sure churches are addressing those needs. Actually, I believe churches could learn a lot from the homeless and hungry if they were willing to open their eyes to the truth." Once on the street, Lyle learned quickly some important things needed for survival, including who to trust and not trust, where to get meals, where to sleep so that he would not be arrested by police and where to "hang out." "People on the street don't trust you or talk with you at first. They want to know who you are and why you are homeless. It's not that they are rude, but just very direct. "Much of what I learned, I already knew from my years as a pastor, but I wanted to hear it from the homeless. I learned immediately that Loaves and Fishes served a meal every day. That meal was delicious, and the volunteers were great." Something he was not very familiar with was a Clarksville program called the Food Initiative. It is a group of teens who are involved in different food projects around town. When he ate at Loaves and Fishes on Wednesday, volunteers from the Food Initiative were serving meals. Two young men were especially impressive. "These two high school boys called me 'sir,' introduced themselves to me, shook my hand and wanted to know how I was doing. They treated me with respect and dignity. These are our future civic leaders and church leaders. Each had a servant attitude, not a judgmental attitude." Although he never made it to Manna Café, other homeless said that agency was the best place to go for assistance. He also heard about the Old Firehouse. He walked there one morning from downtown to get breakfast. He noticed there were only five people there and wondered why. "After arriving and being handed a bunch of paperwork to complete and submit, I decided maybe the paperwork requirements kept people away. It was a hassle. I did get to take a shower and was grateful for that." Lyle had a great experience at The Well, a program located on Union Street sponsored by the Church of Christ at Trenton Crossing. "Every Wednesday evening, they provide a great meal, an uplifting message and you are accepted there. You can even get a haircut at The Well. Those folks care." Remarking on what he now understands so much better, "Homeless people walk slowly, and now I know why. They physically hurt all over from sleeping on concrete, the ground or on wooden floors. They don't own Air Jordons and thick socks. People should try sleeping on a wooden floor sometime. It's painful." Something that Willie noticed during his week on the street was the large number of families who battled hunger every day. Most are referred to as America's working poor. They simply do not have enough money to feed their children on a regular basis. "I met one man who cleared $125 each week in his job, but his rent was $100. He had to use the remainder for bills and food. I sure don't know anybody willing to trade places with him." Throughout the week, Willie kept a small journal of what he was experiencing. These notes become the foundation for the sermon he delivered at Sango UMC on June 23, a sermon that caught the congregation off-guard. Only four people at the church knew what Willie was doing. Early morning on June 23, Willie lay under a tree on the church lawn covered up by a big overcoat. He still had not shaved or combed his hair. He wondered how many people would approach him and offer him food, or a place to sit inside an air conditioned room, or just see how they could help. Twenty people spoke to him and offered some type of assistance. The sermon title was "The Least Used Parts of the Body" and based on I Corinthians 12:12-15. According to Pastor Lyle, "Often the least used parts of the body are the ones that mean the most, like our heart and mind. We need to understand that there are no small or least used parts in the body of Christ. "Too many of us only want to serve God one hour each week. That doesn't cut it. That is not God's plan." While he preached, his daughter-in-law cut his hair and his daughter helped shave off his scruffy beard. He changed shoes, and beneath the overcoat, he was wearing his Sunday clothes. He put on a tie and his suit coat, all the while continuing to preach his message. Before the 200 people gathered that morning, he went from looking like a homeless person to the new pastor of the congregation. "This was not some grandstand show on my part. I wanted everybody to know what I had been through, what I had learned and the physical and emotional discomfort I experienced and that I am still dealing with. And I made sure to mention more than once that Christ was not comfortable on the cross." Willie got the attention of those present, and some were uncomfortable. "If I made someone squirm, then so be it. Sango UMC is not going to be a congregation that talks about issues and solutions. We are going to be part of the solutions to the problems we face in our community. We are going to get our hands dirty as we live like Jesus and help others. Talking is easy. Doing is harder, and sometimes it is really uncomfortable." At the end of the sermon, Lyle issued his challenge. Part of that challenge called for the congregation to "do our mission," and service to others is going to be a major part of that. #117: Lindsey Stirling's Star Wars Medley.